◼ SHIA LABEOUF INVITES YOU TO RING HIM AND TO #TOUCHMYSOUL – the art collective LaBeouf, Rönkkö and Turner are standing by, waiting for your calls as part of a new project at Liverpool’s FACT gallery, 11am–6pm GMT from Dec 10–13. Telephone +44 (0)151 808 0771. Or view the live stream. Or visit the gallery in person. “ Luke Turner and Nastja Säde Rönkkö, it’s safe to say, don’t quite have the same growly charisma as Shia LaBeouf, a world-famous Hollywood actor turned performance artist. Indeed, they look as if they’ve won a competition to hang out with him. But the unlikely trio are adamant that they are an artistic collective, each on an equal footing. Turner wags a metaphorical finger at journalists who have failed to understand this. So what counts as a soul being touched? The TMS artists did not specify, neither before the four-day performance, nor after. The trio gave a post-event interview to Dazed Digital in which they still did not answer these questions. They talked about phoning and listening. The words meaningful and connection and rewarding experience recurred. All are intensely subjective, so how can we or they evaluate the outcome? Luke Turner said that they wanted to “be receptive to whatever feelings might travel down the phone lines to us over those four days”. Do feelings touch a soul? Nastja Säde Rönkkö said: “Some people moved us with their sweet energy, laughter, singing, silence, life stories, emotions.” Does all this mean touching a soul? 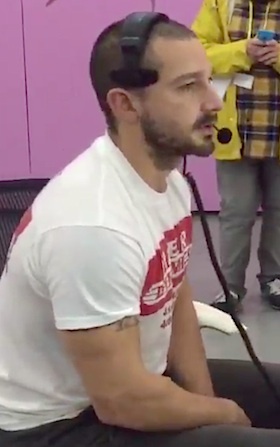 Shia LaBeouf spoke mostly in blank verse, very little of which made sense: “Connection is to be lived / And the internet is not any less alive.” Hm. A curator said: “It’s about the framework of the show: what do you think is a real experience?” Ah, good old reality. There you go. The event seemed to conclude with LaBeouf being tattooed with the words: “You. Now. Wow.” We were shown him being touched by the tattooist’s needle. A project that doesn’t set out its brief beforehand risks missing its mark. It’s hard for callers to know what they’re expected to do or to evaluate any subsequent touching. The result was yards of telephone transcripts which are available to read online at touchmysoul – mainly touchy-feely, hippy-dippy psycho-babble and precious little enlightenment. This entry was posted in art, Culture, Media and tagged #touchmysoul, Dazed Digital, FACT gallery, Jerry Springer, LaBeouf Rönkkö Turner, Liverpool, participation, performance, streaming, telephone, Video. Bookmark the permalink.